Engineers will deploy a trash collection device to corral plastic litter floating between California and Hawaii in an attempt to clean up the world's largest garbage patch in the heart of the Pacific Ocean. 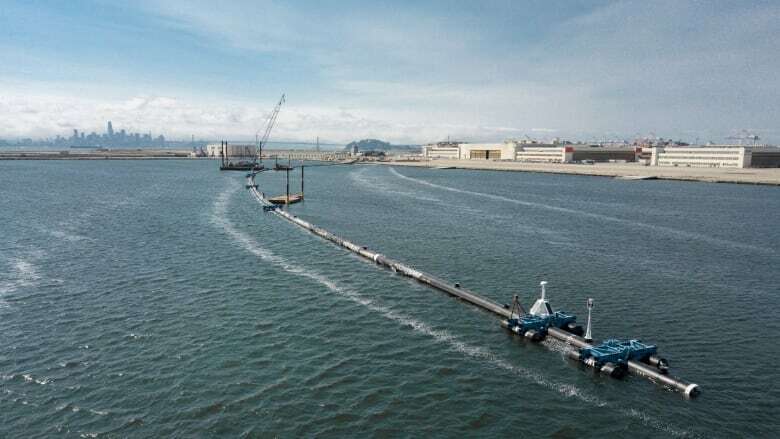 A giant trash collection device left San Francisco Saturday on its way to pick up plastic litter floating in the Pacific Ocean between California and Hawaii. The 600-metre-long floating boom is bound for the Great Pacific Garbage Patch — an island of trash twice the size of Texas. The buoyant, a U-shaped barrier made of plastic and with a tapered three-metre-deep screen, is intended to act like a coastline, trapping some of the 1.8 trillion pieces of plastic that scientists estimate are swirling in that gyre but allowing marine life to safely swim beneath it. Fitted with solar-powered lights, cameras, sensors and satellite antennas, the cleanup system will communicate its position at all times, allowing a support vessel to fish out the collected plastic every few months and transport it to dry land where it will be recycled, said Slat. Shipping containers filled with the fishing nets, plastic bottles, laundry baskets and other plastic refuse scooped up by the system being deployed Saturday are expected to be back on land by the end of the year, he said. The Ocean Cleanup, which has raised $35 million US in donations to fund the project, including from Salesforce.com chief executive Marc Benioff and PayPal co-founder Peter Thiel, will deploy 60 free-floating barriers in the Pacific Ocean by 2020. "One of our goals is to remove 50 per cent of the Great Pacific Garbage Patch in five years," Slat said. Leonard said eight million tonnes of plastic waste enter the ocean annually and that a solution must include a multi-pronged approach, including stopping plastic from reaching the ocean and more education so people reduce consumption of single use plastic containers and bottles. "If you don't stop plastics from flowing into the ocean, it will be a Sisyphean task," Leonard said. On Sept. 15 about one million volunteers around the world will collect trash from beaches and waterways as part of the Ocean Conservancy's annual International Coastal Cleanup. Volunteers last year collected about 10,000 tons of plastics worldwide over two hours, he said. The system will act as a "big boat that stands still in the water" and will have a screen and not a net so that there is nothing for marine life to get entangled with and as an extra precautionary measure, a boat carrying experienced marine biologists will be deployed to make sure the device is not harming wildlife, Slat said.